Pulling off the main street onto a weather-beaten side road, we see a plain boxy brick building featuring a rusty fire escape foregrounded by a weedy three-car concrete lot. Avoiding the potholes, we climb over the natural speed bumps into the lot, park, step over to the door beneath the fire escape and knock. One of the house numbers is missing. The doorbell dangles lifelessly from a couple of wires. When the worker comes to the door he apologizes and asks us to wait while he gets his coat. Through the door we glimpse a jumble of old furniture crammed into the tiny space. The smell even outside suggests a dead animal. The slim African American resident of this apartment is an employee of the multi-billion-dollar University of Illinois in Urbana, the same institution that three years ago hired former president Michael Hogan at $620,000, a 37 percent increase over his predecessor. That predecessor had just been forced to resign in scandal but remains at UI today, making $300,000, while the former chancellor of the Urbana campus, forced to resign in the same scandal, makes $250,000. Hogan himself was soon forced to resign in another scandal, but also remains on the UI payroll, at $285,000. Taken together, these three disgraced administrators alone are paid enough to hire twenty-six building service workers (BSWs) or forty-nine food service workers (FSWs) at UIUC. Yet when these BSWs and FSWs seek a raise, the University claims it cannot afford it. This fight for a living wage and economic justice is just one reason passersby will often see service employees picketing in front of a University building, or filing into the building shouting and chanting, surrounded by police cars―and why service employees at UIUC voted by over 91 percent to authorize their elected bargaining committees to call a strike if progress in contract negotiations is not forthcoming. 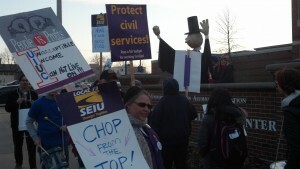 The almost 800 service employees at UIUC belong to SEIU Local 73 Chapter 119. They cook, clean, sweep and mop floors, wash soiled laundry for handicapped students, set up tables and chairs for events, move heavy furniture and files, strip and wax floors, shovel snow and ice, wash dishes, deliver campus mail, and do “other duties as assigned.” These are the workers who are called in to work in the middle of the night or forced to stay at the end of their shift when there is a heavy snowfall or a flood inside one of the UIUC buildings, while top-paid administrators are home safe and warm in their beds. BSWs and FSWs are essential workers, until the time rolls around to talk about pay. Like other US workers, these employees have experienced years of declining real wages. In fact, most BSWs and FSWs are now taking home less money than they did six years ago, even before adjusting for inflation. Why? University spokespersons are fond of pointing out that the institution’s state appropriation has been declining for many years, now below an appalling 14 percent of the UI budget. Yet the University has been able to grow in spite of declining state funds, through tuition increases―9.5 percent for Fall 2010, 6.9 percent for 2011, 4.8 percent for 2012―and record-breaking donations totaling $2.5 billion since 2007. As a result, the UI’s overall operating budget has grown steadily, from $3.9 billion in 2008, right through the worst years of recession to $5.4 billion approved this year. That’s an increase of more than 38 percent, during a period of belt-tightening for the UI workforce in which the “Campus Wage” increased a total of seven percent for civil service employees, and mandated “furlough days” subtracted a few days’ pay from faculty and some others. Yet such belt-tightening does not affect all UI personnel the same way. Two years ago the Campus Faculty Association (CFA) at UIUC released a study showing that the number of UI administrators had increased by half over a ten-year period, and administrative salaries have mushroomed right along with numbers. In fact, the Graduate Employees Organization (GEO) recently released a list of just twenty-eight administrators whose total raise this year amounted to over $5 million. This amount is more than triple the total cost of the contract proposed by the Service Employees―for twenty-eight times as many people. But it is not all about pay. In fact, most of the biggest conflicts have been non-wage issues. Managers at UIUC, for example, attempted to unilaterally take away five holidays including Christmas Day from mail messengers, who deliver campus mail. The Service Employees blocked this change, but the University now insists on the holiday grab in contract negotiations. Likewise managers have contracted out BSWs’ floor maintenance work on over 30 occasions, in violation of labor law and the SEIU contract. Each time the Administration promised it would never happen again. Yet in response to an unrelated union proposal that members be allowed to rotate assignments involving heavy moving work, UI negotiators proposed contract language that would allow unlimited contracting out, saying that underpaid BSWs are “pricing themselves out of the market.” But are they? The University Facilities and Services department (where the BSWs work) charges $1.05 per square foot for the floor work, while the University paid the private contractors $1.25 per square foot―almost 20 percent more. BSWs have often been called in to re-do the contractor’s work due to poor quality. In food service, when contract talks became heated, managers decided to retaliate against workers serving on the union bargaining committee. Out of six food service employees serving on the committee, two have been fired for allegedly arguing in the hallway, three have been docked a day’s pay for attending scheduled negotiations, and one is serving a year’s probation, allegedly for allowing a union representative into the break room to talk to employees on break. None of these activists received any warning, and one has never even been written up for any offence in 14 years at UIUC. The activist on probation was in line for a promotion, but since receiving the discipline her test scores have been deleted, and she is no longer on the promotion list. SEIU has filed grievances and Unfair Labor Practice charges in the above and other matters. Regular pickets continue. And as a possible strike looms, UI negotiators recently tried unimpressively to convince the union to drop all charges in exchange for an additional six cents pay raise for a handful of the union’s newest members. The union would also have to accept whatever the Provost decrees as the “Campus Wage” for everyone else. This “Campus Wage” is the same unilateral determination that two out of the last four years has amounted to precisely zero. With job security and union rights on the line, and health care and other costs set to spike again this year, Service Employees have just one answer to such an offer: get serious or we walk. Ricky Baldwin is a Senior Field Organizer for SEIU Local 73, activist with Jobs With Justice, and occasional contributor to Labor Notes, Z Magazine and Dollars & Sense.